The final concert of the Grand Rapids Symphony's first full season under Marcelo Lehninger was all about Beethoven in a big, thrilling way. The 2018 Picnic Pops at Cannonsburg Ski Area opens Thursday and Friday, July 12-13 with "Classical Fireworks." Highlights for the next four weeks include appearances by Ben Folds and Tito Puente Jr. Go online to PicnicPops.org for tickets and more information. The Richard and Helen DeVos Classical Series opens Friday and Saturday, Sept. 14-15, with Beethoven's Symphony No. 7 plus violinist Karen Gomyo performing Barber's Violin Concerto. The Fox Motors Pops Series opens Friday through Sunday, Sept. 21-23, with The Music of Paul McCartney starring singer and jazz guitarist John Pizzarelli. Beethoven’s Ninth Symphony is one of the crowing achievements of Western culture. The music, some of Beethoven’s best, stands on its own. Its message that all of humanity is a brotherhood elevates it to a whole new level. In 1989, following the fall of the Berlin Wall, Leonard Bernstein led a performance in East Berlin on Christmas Day with an international cast of singers and musicians that was broadcast throughout the world. It would be the last time Bernstein conducted Beethoven's Ninth before his death 10 months later. It’s also the piece that Music Director Marcelo Lehninger chose to end the first full season that he created for the Grand Rapids Symphony since he was appointed music director in 2016. Together with the world premiere of Alexander Miller’s “Testament,” Beethoven’s epic Ninth Symphony brought the orchestra's ground-breaking 2017-18 season to a thrilling conclusion. 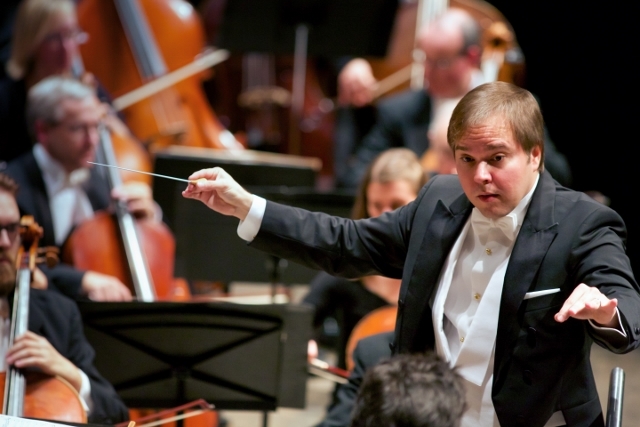 The Grand Rapids Symphony's 88th season was an exciting year of big pieces including Verdi’s Requiem in November 2017 and Strauss’ Ein Heldenleben in March. It also was a season of important milestones such as the Grand Rapids Symphony’s triumphant return to Carnegie Hall in April. 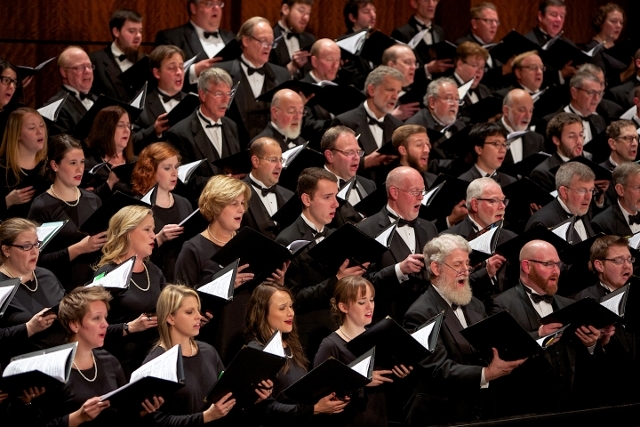 Performances featuring the Grand Rapids Symphony Chorus on Friday and Saturday, May 18-19, in DeVos Performance Hall was the cherry on top. Lehninger, firmly in command of his orchestra and chorus, led an exceptional performance of Beethoven’s Ninth featuring four wonderful guest singers, soprano Jessica Rivera, mezzo-soprano Susan Platts, tenor John Matthew Myers and baritone Richard Zeller. The mantra, “Go big or go home” certainly applied to the performance. The dramatic opening moment, which settled into insightful ebb and flow and a forceful finish led to scattered applause in the audience. Not missing a beat, Lehninger turned to the audience and said with a smile, “If you like it, go ahead.” That led to even more applause. It’s worth mentioning that that was the custom back in Beethoven’s day. People applauded whenever they wanted. More good things followed. An insistent tempo filled the second movement with impressive energy, Lehninger practically levitating himself off the podium as he conducted the piece in triple time that, nonetheless, often feels as if it’s in quadruple time. The warm string sounds enveloped the audience with the rhapsodic third movement with its prominent fourth horn solo skillfully played by Paul Austin. Lehninger capably balanced its two pairs of variations. The finale featuring the singers and chorus is the highlight, but Beethoven still takes a little time getting there. Remarkably, the composer revisits the first three movements briefly at the outset of the fourth movement that is about as long as entire symphonies composed by Mozart and Haydn. Lehninger plunged boldly into the movement with intensity, determination and a blisteringly fast tempo. When the famous “Ode to Joy” melody appeared on Friday, it emerged as a sunrise over the audience. Beethoven did not write well for voices. His music is hard to sing. 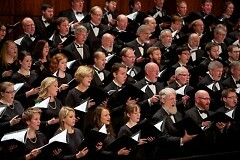 But the Grand Rapids Symphony Chorus, well-tuned from their performances in Grand Rapids and New York City just last month, delivered a refined wall of glorious sound. Following the performance, which ended the concert, the audience erupted in an enthusiastic standing ovation that went on for several minutes. Beethoven loomed large over the etnire evening. The concert also answered the question, what else goes good with Beethoven? Try Alexander Miller’s Testament, inspired by Beethoven’s “Heiligenstadt Testament,” which Beethoven wrote in 1802 to his brothers, expressing his anger and frustration at losing his hearing. Though he considers suicide, Beethoven declares his determination to live on for the sake of the music he has yet to write. 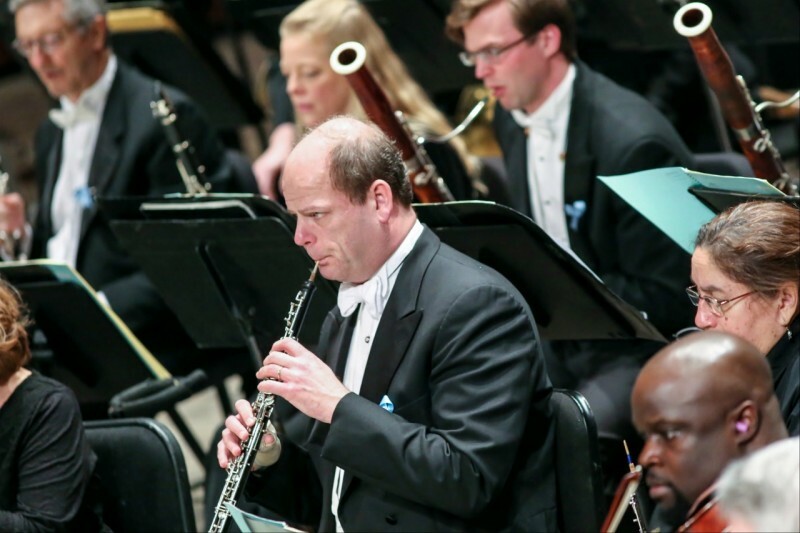 Grand Rapids Symphony commissioned the 16-minute work and gave the world premiere of the piece by its assistant principal oboist by night and composer-in-residence by day. Miller, who has battled his own medical challenges leading to brain surgery and a lengthy recovery, which he's blogged about at HusbandAmused.com, was particularly inspired by Beethoven's heroic efforts to overcome his hearing loss. Testament is a raw, emotional work offering a cinematic look into the inner recesses of Beethoven’s mind and soul, masterfully arranged for bass-baritone, chorus and orchestra. Zeller’s magnificent bass baritone poured forth the anguish of Beethoven, revealing his innermost thoughts. The Grand Rapids Symphony Chorus, serving as a Greek chorus with a big, opulent sound, offering commentary and added perspective. The contrasts are rewarding, ranging from a solo voice set against a minimum of strings to an angelic choir of women paired with a solo cello, to full onslaught of orchestra and chorus delivering a pulse-pounding performance. Much as Beethoven could mesmerize with a single melody or suddenly move mountains of sound, Miller’s Testament offers a wide range of musical experiences in one satisfying setting. As it happened, Lehninger conducted the world premier performances of two of the three works on the program. The concert opened with Variações Temporais, Beethoven Revisitado (Temporal Variations, Beethoven Revisited) by Brazilian composer Ronaldo Miranda. Lehninger led the premiere in 2014 with the São Paulo Symphony Orchestra in Brazil. It’s a witty, series of short, orchestral portraits, each inspired by another of Beethoven’s musical works, so it’s very musical. At times, it’s a clever game of “Name that Tune.” Early on, apart from assorted percussion, it’s also something that Beethoven might have arranged himself. But not for long. It turns into an exciting, colorful tapestry of sounds using the full resources of the modern orchestra. The audience clearly enjoyed it.